The Alleluia, op. 44, came into being on Easter Monday, 1972 in Salzburg. The Gregorian Easter Alleluia - quasi as mode - is present in every bar. A restrained beginning, marked by the presentation of the musical material in tritone separation, meets with a contrasting sharply accented theme in the pedal. Passing through an often garland-like set of loose variations, the theme reaches a bitonal climax (f minor and D Dur simultaneously). The dramatic development is repeated, held back by arioso interruptions, until the principle idea is finally led to a close in dense chords. In the final chord, all notes of the theme are heard simultaneously. In his Alleluia (1972), notes are clustered into drops of sound, serving also as background chords for flourishes from the Gregorian chant, short sections are formed with ostinatos and rapid, wide-ranging running passages over the whole keyboard. Between, beneath and above, the cantus firmus, often in chords, is heard. A piece for cathedral organs. 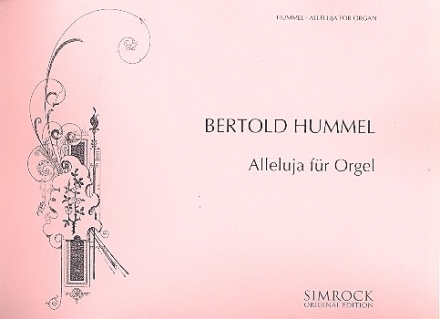 As a successful close, crossing the bridge to contemporary composition, Weinberger presented Hummel's "Alleluia" (1972). Starting from the Gregorian Alleluia, an independent, multi-layered world of sound is created. It consists of different complexes of motifs, all of which are related to the original theme, revealing it in manifold and otherwise concealed perspectives. Happily, there is no hint of concessions, in the sense of superficial platitudes, to the purely conventional listener.